It was around 42 degrees Celsius when I made this image of an old windmill near the tiny community of Byaduk in Western Victoria, Australia. I made this photo a few years ago on Australia Day, January 26, near the small town of Byaduk in the Western District of Victoria. Byaduk is the first town you pass through on the drive between my hometown, Hamilton, and the beautiful seaside town of Port Fairy. 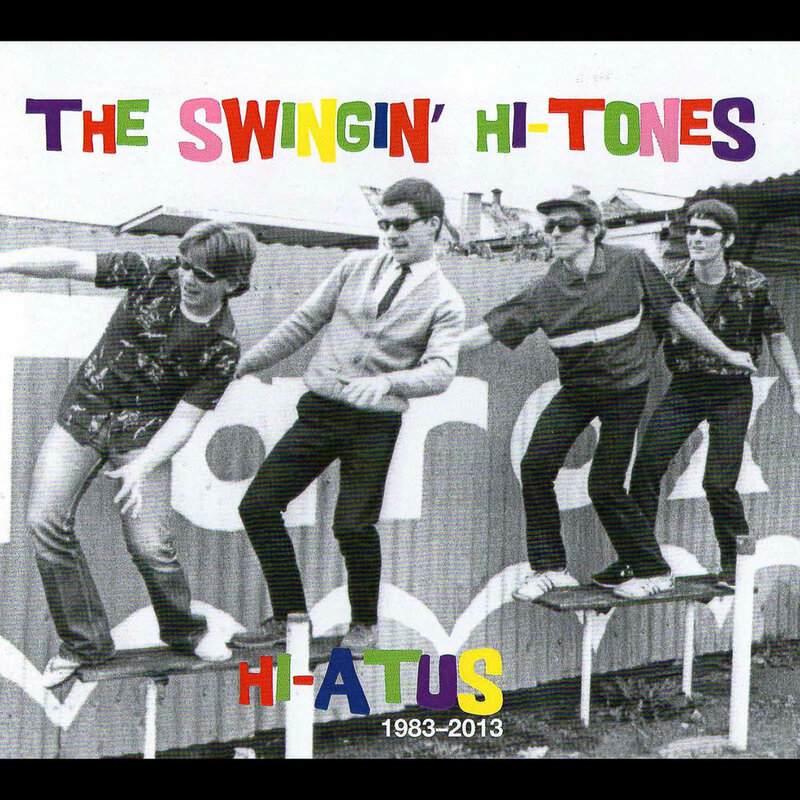 The front cover image from the Swingin' Hi-Tones ‘Hi-Atus' 1983-2013 CD Cover available on the Thong 'n' Dance label. I’d travelled down from Melbourne to play a gig in Port Fairy on January 25 with a band I’d played in 31 years ago. Yikes! The Swinging Hi-Tones remain Australia’s premier inland surf band. Our songs, which are instrumentals, are self-penned originals, though we throw in one or two standards for live gigs. As we’d only played or practiced on four occasions over the last 31 years we were all a little nervous. And with good reason: we made loads of mistakes and I completely messed up one of our songs. 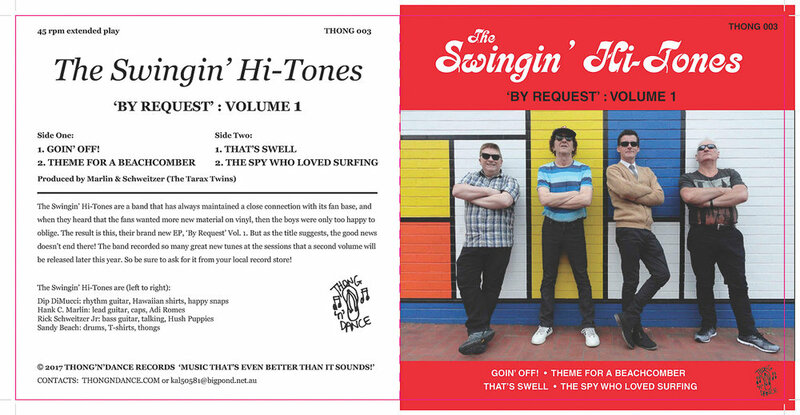 The cover for The Swingin' Hi-Tones 'By Request' vinyl EP. Still, there were enough positive signs for us to decide to continue on and play/record on a more regular basis. In fact I only started playing guitar again around six months before that gig when I joined a bunch of other players in Melbourne to form the Chicken Pickin’ Turkey Jerkers. That name didn’t last long, though I’m unsure why, and we became the Murder Of Crows. I played with that troop until December 2016. A view across a dam and fields towards green power generation on the cliffs at the Yambuk Wind Farm in Western Victoria, Australia. Though it’s now 5 years ago I want to send thanks to all those whom attended the gig in Port Fairy. Your support was greatly appreciated. Despite our nerves and the fact that we were playing in the middle of the afternoon, the first of six bands on the bill, we noticed the genuine interest and attention you paid us during our performance. Your applause and encouragement was greatly appreciated, especially given how rusty our performance was. Not only was the gig a good experience, the drive down was really interesting. It had been many years since I’d travelled down to Port Fairy and I decided to do it again the following day, this time exploring some of the backroads along the way. Unfortunately, the following day was a stinker and the stony paths I explored were not ideal for my current car: a Mazda 3. My previous two cars, a Subaru Forester and LandRover Discovery, were much better suited to this kind of exploration but, with my focus predominantly on overseas travel, the decision to move down to a small snappy car for city driving was the right one. I’d like my next car to be another AWD, ideally one that doesn’t burn fossil fuels. I’m prepared to wait until I can realize that particular dream. Golden light illuminates a large stack of hay bales near the town of Byaduk in Western Victoria, Australia. The primary photos in this post were made on Australia Day. Any relationship between these photos and notions of what it is to be Australian and the mythology associated with the Real Australia, while interesting, are purely coincidental. To be frank the 26 of January is probably more important to me as the day before my birthday rather than the day Captain Cook disembarked onto the shore at Botany Bay and claimed this land for the English Sovereign. I’m very happy to have been born and live the life of an Australian and I would not be who or where I am without that event having taken place. But much that followed on from that day in 1770 has had catastrophic consequences to this country’s indigenous peoples and our natural environment. Australia Day is a national holiday in my country. When I was an employee I was grateful for the holiday. But I’m no flag waver, particularly given the symbolism associated with it. While I love many of my countries sporting heroes, I’ve taken on my mother’s practice of occasionally barracking for the opposition, particularly when they’re the underdogs. I think that’s an example of the Aussie notion of a fair go and also a great way to foster inclusiveness in a country that’s become such a multi-racial society. These days, and without any sense of elitism, I consider myself to be a citizen of the world. These photos were all quite challenging to make. In addition to the heat the wind was blowing. I remember having to close my aperture down considerably to achieve the very large Depth of Field I wanted. As a result I had to show a great deal of patience and wait for the wind to stop blowing to be able to make the images at relatively medium shutter speeds. In the case of the image at the very top of this post, I wanted the foreground grasses to be as sharp as possible so I opted for an aperture of f/22. It worked out fine and I like the emotional playoff between the warm foreground grasses and the cool blue of the sky. As far as the windmill is concerned I find such subject matter as emotive as the next person, whether they be monarchist or republican. I guess I’m more of a reformed brown coat. While I known what I want, and I’m confident we’ll get there, I’m more than happy for other people to express their views along the way. Often things change when the time is right, or when there’s simply no time left for complacency.